According to the National Association of Manufacturers, you are not alone! 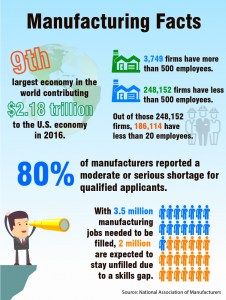 As you can find in the infographic below, many manufacturing firms in the U.S. are small. Out of 251,901 manufacturing firms, all but 3,749 firms were considered small with having less than 500 employees. Three-quarters of these firms have fewer than 20 employees. With U.S. manufacturing being the ninth-largest economy in the world, it has contributed $2.18 trillion to the U.S. economy in 2016. 3.5 million manufacturing jobs needed to be filled, 2 million are expected to stay unfilled due to a skills gap. 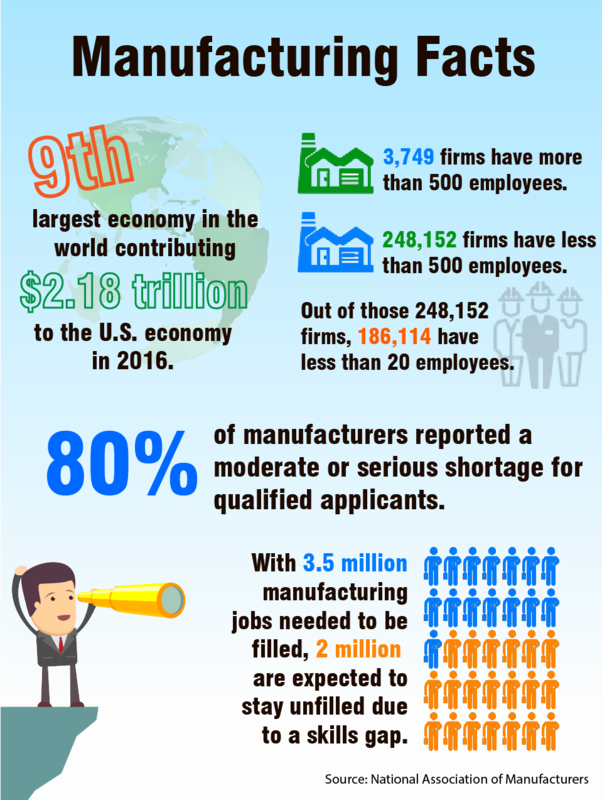 In fact, 80 percent of manufacturers reported a moderate or serious shortage for qualified applicants. So what is going on? 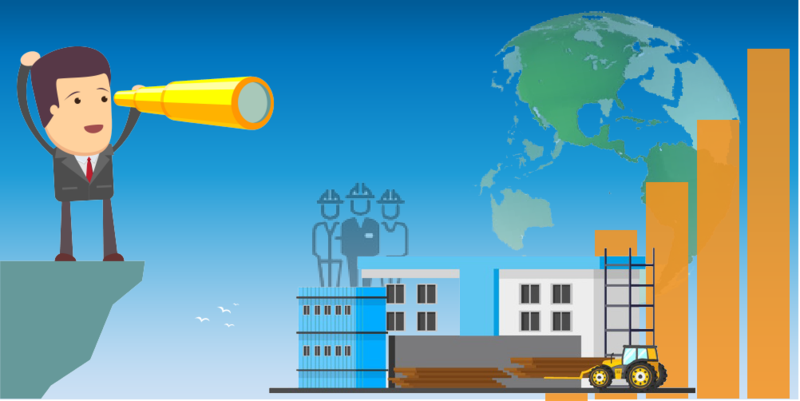 Is it a truly a labor shortage? Are there really less people needing jobs? Or is it more of a skills shortage? Are there less skilled people out there? Or what if it is a marketing problem? Perhaps we are not marketing our companies enough for potential new hires? Or what if there is a “disconnect” between the educational system and vocational jobs like manufacturing, a theory Mike Rowe has openly shared. With limited employees, we don’t have time to do it all. With outsourcing, we can rely on component providers or contractors to do some of the work for our business, lessening headaches and net costs. If high schools, colleges, and parents are failing to inspire kids to take vocational jobs, along with not providing opportunities for kids to learn the proper skills, then it come down to us, as employers, to teach our workers the skills they need to move up within the company. Select one of the two paths, or a combination of both. Neither path will be easy and it may force you to get creative. In our next post, we will share how we have outsourced and skilled up to close the gap. Do you feel a skills shortage? How has the skills shortage affected you? I have often thought back to my youth, in the 50s. People would get a job, and stay there for their entire career. By the 80s, that had changed. Businesses were moving to a “just-in-time” model, and people would be laid off, rehired when they were needed, and laid off again. With this model, how could businesses expect employee loyalty? At the same time, employees would jump from job to job, for higher pay, better benefits, and the like. They no longer felt tied to a single employer, much like baseball and football players. So, it’s a two-way street. Give someone a challenging job (possibly switching tasks, in a factory setting) pay them well, and appreciate them. Let them know that they are the reason the company is there, and they not just replaceable widgets, to make more money for stockholders. I really think it has to start with the employer. Absolutely. As the times change, so must employee management. Love hearing about your experience and what you noticed! Thanks for sharing! OK then, let’s address the skilled labor problem for cabinet shops. There is only a minor skilled labor problem. If you paid 60K a year you’d have all the skilled labor you’d ever need. Why can’t you? Good question. There are too many cabinet shops doing the cabinet shop thing the same way since forever. The first ones with the big machines did well wiping out the weakest. Next the ’08 crash wiped out the weakest. Now the weakest are the inefficient. Go look in your shop and see what machines and parts of the building are sitting idle. Now multiply that by the 400 mid-size shops in the area. There are too many machines in too many shops and too little courage to try anything different. No amount of skilled labor is going to get us out of this dilemma. You will have to train a bit. Always did, always will. Woodshop News 11-2017 Get Smart & Outsource “Competition today isn’t limited to a few custom shops across town. With online design and purchasing, (like from EASI) wood shops are now also in competition with home builders, designers and architects, (door manufacturers and panel suppliers), kitchen and bath dealerships, big box stores and even consumers. If custom shops don’t compete on price and offer design innovation and superior service, their days are numbered. You have all you need right now. You only have to re-organize how you do cabinet making. Training will become easier because you’ll have more resources to do it with. The first ones to adapt – change – just like in the ‘90’s and after the crash will be the ones to thrive. Very insightful! Thanks Jim! Adaptation is extremely important in order to survive the competition. Previous PostPrevious Is gray the new white?